Our full-automatic banana chips line adopts the most advanced banana chips making machines. Banana chips are crispy snack food similar to potato chips. Banana chips are normally made from under-ripe fruits by frying the slices in oil. The processing capacity we supply is from 60kg/h to 300 kg/h. 1. Every machine is made of high quality stainless steel, up to health standard, easy to clean. 2. The frying machine keeps the frying oil clean, thus reducing oil consumption and improves banana chips quality. 3. High working efficiency, save labor and energy. 4. Equipped with advanced and efficient heating system, avoiding energy waste. 5. Superior quality and competitive price. 6. Suitable for large scale banana chips production.
? Banana slicing machine: equipped with sharp blades, bananas are cut uniformly.
? Hoister: elevates the banana chips into the washing machine.
? Banana blanching machine: to blanch the banana so that it is easier to frying and keep the color of the banana chips.
? Banana chips dewatering machine: to dewater the water of the banana chips after blanching.
? Banana chips frying machine: full automatic frying can reduce the moisture to 2% and get the crispy chips.
? Banana chips de-oiling machine: remove the oil of the banana chips.
? The flavoring machine: used for seasoning the fried chips. Whichever flavor is needed totally depends on yourself.
? 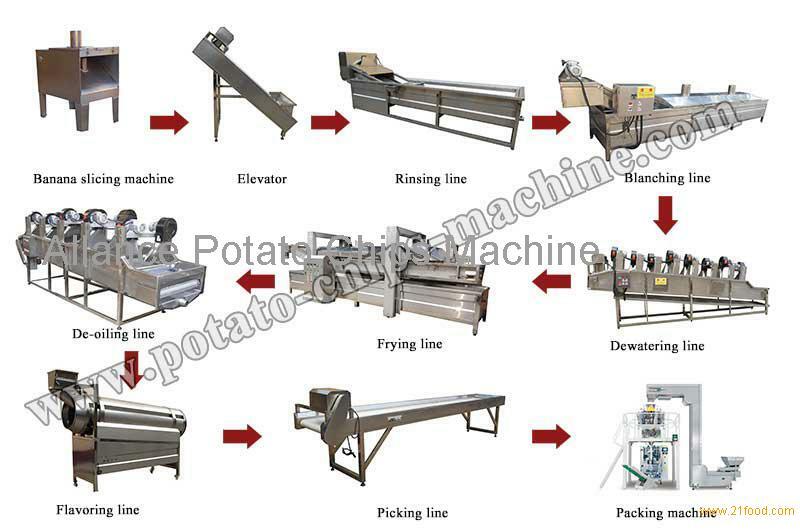 Picking line: conveying the banana chips into the automatic packing machine.
? Automatic banana chips packing machine: full automatic filling, data printing, sealing, etc.